I think it is super important to know you have options for products for your baby. 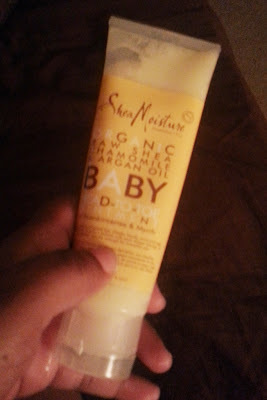 I am pumped to tell you about the Shea Moisture Organic Baby care products. I am sure most of you are familiar with Shea Moisture hair products that are pretty awesome (talking about it HERE). I could only guess that the children’s products would have to be on the same HIGH level. From L to R: Red Bush and Babassu head to to lotion and wash, Raw Shea Butter Baby Oil Rub, Raw Shea Chamomile and Argan Oil Head to Toe Ointment, Organic Olive and Marula Head to Toe lotion and wash, Raw Shea Butter Eczema Therapy and Eczema Bar Soap. The head to toe washes and lotion are awesome! More moisturizing the other baby lotions that I have used. The Red Bush and Babassu wash and lotion is designed to protect and moisturize the babies skin naturally. The Olive and Marula wash and lotion moisturizes as well as heal skin and reduce redness. Let’s talk about this eczema soap! The smell is divine! Luckily Peyton, has not had any eczema issues but this soap is still great to use. I am currently having Mister test it out since he has issues with eczema, he doesn’t know it’s technically “baby” soap! You know they don’t pay attention! So far so good! Raw Shea Butter Eczema Therapy is great to have on hand for several reasons. Great for sever dry skin, scratches and marks on the skin, moisture and eczema of course! Winter is coming and if you live is a really cold area like Chicago where your skin feels like its going do dry up and fall off this would be great! I am in love with the Argan Oil Head to Toe Ointment! Since Peyton refuses to potty *rolls eyes* and is still in diapers I use this to protect her skin. I use the Argan Oil Head to Toe Ointment for diaper area, cuts, lips … you name it! It’s Organic! You don’t have to continue to put that junk that is in other baby items on your babies skin! The ingredients are well thought out to take care of your babies skin. The Smell!!! Your baby (or yourself) won’t smell like a bottle of baby power (don’t get me wrong it smells good) but the light scents are wonderful but not overbearing! Packaging! I love the pumps on the lotion. Only take two pumps for me to lotion Peyton up! The pumps help with wasting product and it last a long time. It works! You baby won’t end up with dry skin minutes later! Have you tried the Shea Moisture Organic Baby Products? At least try the lotions, you will not be disappointed! Think about giving Shea Moisture Organic Baby Products for a shower gift! *I was provided product for review purposes. Opinions expressed are my own. Summer Beauty Hangout Live on Google+ Giveaway! I have their other products but not the baby line. Thanks for the review. I will keep those in mind, especially since…. I will be having another baby around soon. Great review. I will have to look into this. It sounds like a great product! I’ll def pick some up! I love their hair products! I love, love, LOVE Shea Moisture. My girls are mixed and it is the only product that does their hair some good! I LOVE it for my son. I switched about a month ago to the raw shea butter line and could not be happier!! It’s amazing how many un-natural ingredients are in other baby csre lines. I have peace of mind with Shea Moisture!!! I like the Shea moisture products. I want to try this one with the argan oil and the red bush one. I use the curl and style milk a lot! I use their hair products on my girls’ heads. I will have to tell my Sis to try the eczema products on my nephew. Great review. Thanks! I still have yet to see these products in my store. I really want to try them. I guess I need to go on a hunt for them. My son is mixed and his hair gets dry easily. I dont do alot of protective styling which is one reason his hair rubs off and breaks off. The other reason is because of using heavy products ( vaseline) in his hair. He also seems to break out with any lotion even aveeno. Would you recommend this line for him? Try not to use products with Petroleum. Depending on your son’s age I think the shea moisture would be a great shampoo. You prob need to add some hair milk after shampooing and you should also condition his hair. Check out this post for some products we like. I love this line for baby Phoenix and it smells great! Do they have a hair wash for babies? You can use the wash on hair as well. I would only use it on newborns unless your child doesn’t have much hair. My Baby girl is three months, can i use the Shea Butter Lines on her at this early age? Yes you can! It is one of the few organic baby lines! I wish this was around when P was born! I think this product would be great for all babies. My husbands eczema can be severe and the soap worked on him. These are baby products so I say go for it! this baby line is my favorite,i use since my first son born,10 year i ago now my 2 year old use the Argan Oil Head to Toe Ointment!my favorite line for kids. i use SHEA MOISTURE ORGANIC BABY line,since my first son born,10 year i go,now my 2 year old use this line since shes born,my favorite is Organic Olive and Marula Head to Toe lotion and wash,& for 3 month i use eczema soap! I use shea moisture on my matural hair and I love their products! I just picked up the baby eczema soap for my 4 month old, and although I haven’t used it yet, the smell is divine, not overbearing at all. I can’t wait to use it and if I like the soap, I am getting the oil/lotion!!!! Thanks for the amazing reviews!!! Just picked the eczema bar soap! The smell is lightly divine. I use shea moisture products on my natural hair, and I cannot wait to use this soap ony 4 month old. She has eczema and it hit me today, that duh, I should give shea moisture baby products a try. I am testing the soap out for a,week, and if I like the results, I am getting the lotion/skin oils. I can’t wait to see the results in my little munch’s skin! Yes, I have just started using their shea butter for my 6 month n 5 yr old eczema. So far its wonderful. I use it along with a cream. Its seals the moisture after bathing right in. Thank you! Is the Shea butter chamomile &argan oil baby eczema therapy safe to use on babies hair? If you baby has eczema in their scalp, I would consult with the pediatrician first. I would not use it for “styling”. I know this post is old but can I use this on my infant daughter’s hair? She’ll be a month old in a couple of days. I haven’t washed her hair yet because I’m afraid of what products to use. Hello! Yes, you can use the wash in the babies hair. I actually use it on Harper’s often and she has a lot. Congrats!!! Hi, there. Don’t know if I’m late. I just bought Shea moisture raw Shea,chamomile and argan oil baby lotion with frankincense and myrrh Calm and Comfort for my 4 month old baby. Can I use it on his face? Hola disculpen para mi hija de tres años puedo utilizar estos o el de mango y zanahoria? Is the breath free chest rub safe for a 3 month old?